Check Back Often for New Speaker Announcements! Global Brands Innovation Manager, HP Inc.
Doris in her role as Global Brands Innovation Manager is responsible for fostering relationships with many of the world’s most recognizable brands, and their creative agencies, through meaningful and inspirational digital print instruction, and campaign development. 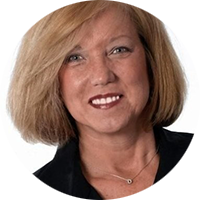 Doris has been an outspoken leader and advocate regarding digital print production, color communication, and cross media marketing. She built her career on a solid foundation with a degree in Print Production from the Rochester Institute of Technology, arguably the best university for such studies in the world. Her leadership skills and extensive industry knowledge are well-documented throughout her career as an executive at HP Inc.®, Datacolor®, X-Rite/Pantone®, Agfa-Gevaert ®, and International Paper®. For close to 40 years Doris has been recognized in the printing, textile and plastics industries as one of the foremost experts on color, a crucial element in corporate branding and identity. Her greatest strengths are her passion, creativity, drive and leadership. She thrives on challenges, particularly those that expand the company’s reach. As a highly sought-after speaker for the industry, she devises and presents motivating and educational presentations, sharing digital print capabilities and brand use stories worldwide. Doris enjoys sharing her knowledge, with brand owners, marketers, and creatives in an effort to make them more successful.